The following are some ideas for walks around the work area. All are voluntary options. One should always keep safety in mind. Watch for lighting, cars, light or darkness depending on the time of year, walk with the crosswalks and do not put yourself in danger. Download our useful Walking Log to help keep track of your weekly exercise. A one mile walk around the community campus. Watch for cars as it is a parking area. Download Map . This walk has some inclines and excellent views. You can also add intensity on this walk should you want to by walking a flight of stairs in between your perimeter loops. Go up to the top floor of the parking garage. Walk the perimeter around. When you get to the start of the 4th floor, turn around and go back up. Start to finish, around the inside and outside perimeter of the roof is 1230 feet, 5280 feet per mile 4-5 loops = 1 mile. Start at Employee Health Office by the fish tank. Head towards the rest rooms and make a right down the hallway. Turn left onto the hallway toward main hospital (opposite Diagnostic). When you get to elevators at end of hallway take a right, then a left, then left (go around the elevators.) Turn right down hallway toward HR & one-day surgery, through door past HR. Go left down the Administration hallway to come out at main lobby. Go straight (towards ER), take a left, then a right down hallway towards Diagnostic. At end of hallway, go left (towards radiology) then take a right and quick right (POB-North elevators) Skip elevators and take stairway to 2nd floor. Go left down 2nd floor hallway to stairs. Take stairs up to 4th floor, and then go down hallway on 4th floor to stairs on right. Take stairs down to 2nd floor, take a right to bridge and cross to POB-South. Take right down ramp, and enter POB-South, follow hallway to end, go down stairs, follow hallway to end (past Wellspring). You will end up on first floor POB, keep going straight, enter diagnostic center. You are back where you started at Employee Health. Repeat if you have time. Start in front of Jacobsen Hall. Go North to Harrison. Right on Harrison. Cross on Crouse heading North. Go straight to Syracuse Stage. Cross Genesee. Left (West) on Genesee. Right to Wellington Place. View Map. Facing the gold elevators in the first floor main lobby, turn right and go through the double doors. Go down South Corridor. Pass Parking Office and Physical Plant Shops. Turn left. Go into the Weiskotten Hall elevator lobby. Choice: elevator or stairs. Once on the second floor, take the door way on the far left. Go North down the hallway past all the lockers towards the double doors. Turn left almost at end and go into the 2nd floor lobby outside of the cafeteria. Make a quick right and a quick left to the stairwells. Go downstairs using the stairs opposite the elevators and repeat loop. Average time 3-5 minutes per loop. Download Map . Start as above route. Instead of going downstairs at elevator lobby go past cafeteria lobby to the garage via the bridge, turn around go back thru bridge down the stair to the hospital lobby. Distance is about 1590 feet (5280 feet in one mile). See map above. From the door at the end of the connecting tunnel to WH go left and up 1 flight of stairs. Turn left out of the stair well and left again going through the double doors in to the old part of Weiskotten Hall. Turn right at the corridor and then right again at the end and back through the double doors in to the Weiskotten Addition. Right once again and down the hall to your starting point at the stairwell. This loop can be combined with the hospital hallway hike by taking the Weiskotten elevators (or stairs) for added variety and distance. Start Weiskotten Hall, turn right onto Irving Ave. Go South 3 blocks. Turn left at Irving and Raynor Ave. Go up the stairs. Enter The Dome, at Gate B. Once inside the Dome, circle the around on the main concourse level. Distance to Dome from Weiskotten is 0.3 miles. Distance around the Dome, 0.3 mile. Travel up Elizabeth Blackwell or Sarah Loguen heading North until you get to Harrison Street. Turn left on Harrison and cross with the cross walk. Travel up Harrison until you get to the Museum. There is an indoor track at the IHP building on the second floor. Employees may use the outer lanes (so you do not interrupt patient activity) of this track for walking any time the IHP building is open. Running is permitted only when PT or Vitality are not in session. IHP is locked after 6:30 pm unless you have building access. IHP is locked on weekends. Clean sneakers only. 14 laps on the inside lane are equal to one mile. There is a track outlined around the tennis courts on the Harrison Street side of the CAB. 12 times arougn the track outside of the tennis cours equals one mile. Start at Irving Ave sign in front of Weiskotten Hall. Head North on Irving towards E Adams St. Turn left on E Adams. Turn right on Elizabeth Blackwell St. Turn left on to Harrison St. Turn Left onto Almont Ste. Turn left on to E. Adams St. Turn Right onto Irving Ave. Arrive back at Irving Ave in front of WH. You may start the route anywhere you like as it is a loop. Please go to healthymonday.syr.edu for other mile loops around the city. View Map. Why not walk across the bridge from the hospital, walk up 3 flights and enjoy a walk around the 5th floor of the East parking garage? Try to walk the outer perimeter. Between 5-6 times around the perimeter is one mile. Cars do sometimes come up there so please use caution. Enjoy the view! If it rains, you can always go one floor down to walk or use the stairs. Start on Irving Ave outside of Weiskotten Hall, use the crosswalk to cross Irving Ave at Waverly Ave. Go 5 blocks. Turn right at Ostrom Ave. Go one block to University Ave. You've gone 0.7 miles to this point. You may stop and smell the roses at the Rose Garden at Thornden Park. To return you can go down University Place, through the SU campus, until you get back to Irving Ave. Turn right and Weiskotten Hall will be after the VA Hospital. Another option, when returning take Ostrom north to Marshall Street, turn left and go down Marshall and take in all the activity. View Map. Trail that starts at the steps of UHCC. 1.1 miles. From steps of UHCC travel north on South Townsend Street up to McCarthy Street. Cross with the signal to McCarthy Street. Take a left at the end of McCarthy Street heading south on South State Street. Turn right on to East Jefferson Street and go left heading south on Montgomery Street. Stay on Montgomery and turn left on Adams Street. Travel on Adams until you make a left back onto South Townsend Street. Stay on the left and go back up to Harrison to cross with the cross walk lights and you are back at Geneva Towers/UHCC! If you are a beginner, you can turn back on South State Street or on Harrison Ave until you build up to one mile. View Map. 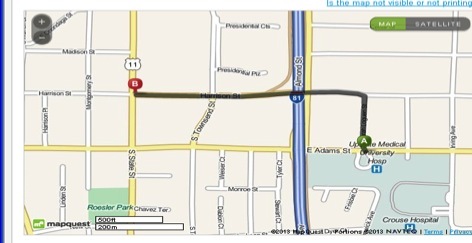 Here is a link to the closest Monday Mile route near UHCC. From hospital circle, come out on East Adams Street. Turn right and walk up Adams Street hill. Cross over Irving Ave, Crouse, University, Walnut Place, Walnut Ave and Comstock. Just a little further and you reach the top of the hill at Ostrom. Turn around and walk back down the hill to the hospital. Enjoy the view! View Map. Last Modified: January 04, 2019. Contact Suzanne Brisk with questions about the content of this page.